My biggest motivator is knowing that I get to - not have to - wake up every day and provide services that I believe in and am passionate about. Skincare is my life; I love what I do and making a difference in my clients’ life is what’s important to me. I have developed a nurturing technique that allows my esthetics to create a harmonious balance of relaxation and results. My services include an array of specialty facials, waxing, microdermabrasion , oxygen and ultrasound. Jeannie Pereira received her Hawaii Esthetician License in 1992 and founded her SkinCare Clinic in 2000. After years of experience in some of Hawaii’s top Spas, her positive energy, commitment and passion led her to envision an exclusive Facial Studio, a sanctuary where clients would receive the highest quality professional care along with courteous service and personal attention. Jeannie designed an extensive facial menu with treatments catering to each individual’s special needs. Jeannie is trained in an array of specialty facials, as well as the latest non-ablative resurfacing treatments. 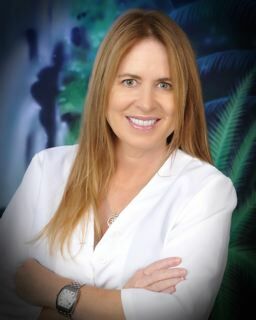 Jeannie’s education and experience includes 25 years of professional esthetician services at some of the finest resorts on Maui, including the Grand Wailea, Four Seasons Wailea, and the Fairmont Kealani, where she was the leader and educator of the Esthetician team, as well as one of the trainers in body treatments and esthetics. Jeannie was also involved with the opening of the Aesthetica Clinic in 1996, working with Dermatologists Dr. George Martin and Dr. Kenny Mallot. Jeannie provided pre- and post-laser services, facials, and corrective peels for their clients. In 1994 she received Advanced ISA Certification in both Facial Massage and Skincare. In 1996, Jeannie received Biomedic Medical Certification, including Biomedic Glycolic Peel treatment and Derma -planing. Jeannie’s exceptional dedication to her profession has led her to attend International Dermatology and Skincare Conferences each year, where she has the opportunity to receive the most up-to-date education available on new skincare techniques and products. © 2016 The Face Place. All Rights Reserved.